What came first, the retreat or Relay? The retreat came first, starting out as a way for a group of internet friends to get together in person. And at that very first retreat some of the ladies attended a high school spaghetti dinner to help the band and choir raise money to go to London. As a result of that trip to London the band and choir decided to thank the community for their support by joining the very first local Relay For Life. And that started my Relay For Life adventure. Over the last 23 years I have participated in 27 Relay For Life events. All of my pattern money (minus PayPal fees) goes to the American Cancer Society as well as the profit from any quilts that I sell. Also, any FUNd raisers that I have at my retreats go straight to my Relay account. 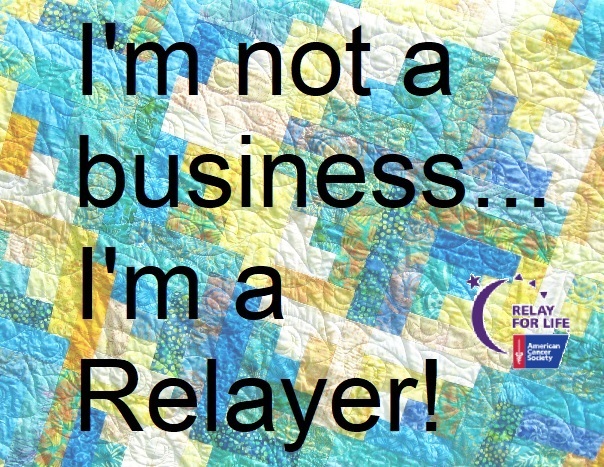 I am not a business, I am a Relayer! What started out as a get together for some internet friends has lasted over 23 years and the friendships have multiplied a hundredfold. Friends just can't miss their yearly reunion and quilting adventures, not to mention the laughter, shopping and all the fun. We'll be hosting our 64th and 65th retreats this spring. Check the Retreat page for more information. You can find Lots of Blocks here. These are free for your own personal use, but if a guild or group would like to use them, I will happily give permission if you email me first. Here are pages about my family, and a page about Delaware Quilts. and here are some Helpful Hints. Please note… if you send me an email, in order for me to reply to you, you must add quiltersretreat@hotmail.com to your address book. Otherwise your server may deliver my reply to your spam folder, and you will never get it. Copyright © 2019 Delaware Quilts. The content on these pages, including text and images are the sole property of the Delaware Quilts and may not be used or reproduced in any manner without consent.